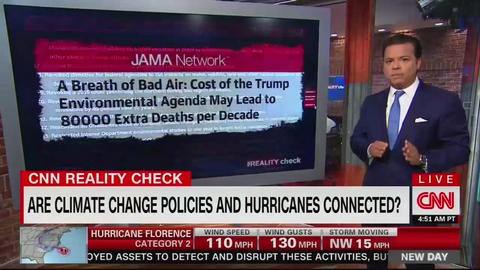 During Thursday's edition of CNN's New Day, John Avlon hosted a "reality check" focusing on the relationship between President Trump's policies related to environmental regulation and climate change and their potential impacts in the wake of Hurricane Florence. He went on to slam the Trump administration for rolling back regulations of methane in addition to its decision to withdraw from the Paris Climate Accord, dismantling the Clean Power Plan, and expanding offshore drilling. Avlon cited a study from two Harvard scientists finding that "Trump's environmental policies could lead to 80,000 unnecessary deaths every decade." Avlon did not just direct all of his fire at Trump; he seemed to imply that the North Carolina legislature has blood on their hands thanks to a decision to pass a bill "explicitly ignoring climate science" in an effort to "boost development along the coast," saying "short-term thinking isn't sufficient to deal with long-term problems." Avlon concluded his lecture on climate change with a call to action: "This isn't rocket science, folks, it's climate science. As long as we continue to aggressively ignore it, the costs in lives and dollars will only escalate."